The first step in keeping white clothes white is to sort dirty laundry carefully. Washing white clothes separately will prevent color bleeding and transfer from colored clothes that leaves the white fabric looking dull. Do not overload the washer. Detergents loosen soil, but there must be enough space between items and enough water to flush away the soil rather than allowing it to redeposit on clothing if the washer is overloaded. Select a detergent that contains optical brighteners. These brighteners will make fabrics appear whiter than they are by tricking the eye. The brighteners bend UV light waves to showcase blue light and minimize the amount of yellow light your eye sees making fabrics appear whiter. If you feel your laundry detergent is not cleaning well, then boost its performance by adding 1/2 cup borax or 1 cup baking soda to each wash load. Use the hottest water recommended for the fabric to help remove body oils and grime that can dull the fabric. Treat stains immediately. Follow stain removal guidelines for fabric types and types of stains. Skip commercial fabric softeners which can leave residue on white fabrics that may contain soil. Add 1 cup distilled white vinegar to the rinse cycle to ensure that all dulling detergent residue is stripped away from fabrics. Check clothes when they come out of the washer. Never dry a garment on high heat that still has a stain. It can become permanent. Retreat and wash again. Dry white clothing and fabrics outside if possible. The ultraviolet rays from the sun will help to brighten and whiten the garment. If drying with an automatic dryer, choose a lower heat setting and remove clothes while slightly damp and air dry. Excessive heat can cause stains and residual soil to yellow. Check iron settings and avoid heat that is too high. Clothes can scorch, and that is very difficult to remove. 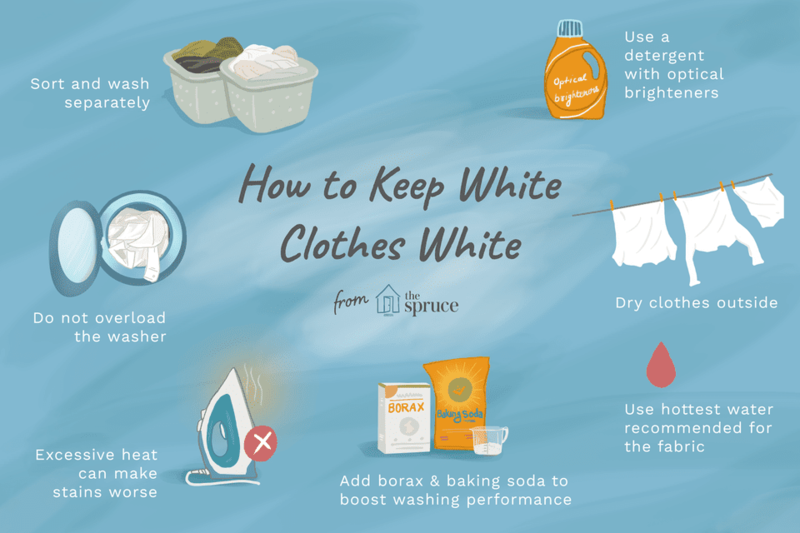 If your washer is not clean, your white clothing will show the results. Clean your washer thoroughly at least every three months. This is particularly important for high efficiency washers--both top load and front load--that use much less water in every load of clothes. Reduce the amount of laundry detergent you are using. Excess detergent can remain in the fibers and attract soil. You need only 2 teaspoons of liquid HE laundry detergent in a high-efficiency washer. If you use chlorine bleach to whiten natural fabrics like cotton, then be sure to use it correctly. Adding bleach with detergent counteracts its effectiveness and overuse can cause yellowing. If you have hard water in your area, invest in a water softening system or add a water softener to each laundry load. The minerals in hard water will deposit on your whites and leave them looking dull. Launder or dry clean white garments after every wearing even if they look clean. Body oils and perspiration can quickly turn a garment yellow. If you like to wear white and want to save money, then be sure the garment is washable and does not require dry cleaning. My Whites Are Already Yellowed or Dingy. Now What? Do not automatically use chlorine bleach to whiten cotton clothes because overuse can cause even more yellowing. An oxygen-based bleach (such as OxiClean, Nellie's All Natural Oxygen Brightener, or OXO Brite) is usually safer and can be used on all washable fabrics except wool and silk. Mix a solution of the oxygen bleach and cool water by following package directions. Mix enough solution that the dingy clothes can be completely covered when submerged in the water. Allow the dingy whites to soak for at least four hours or overnight. Drain the solution and wash as usual. Repeat as necessary to whiten clothes and linens. You can also use a commercial color remover to brighten white fabrics following package directions, or try old-fashioned bluing to restore brightness.